We completed our second R&D trip in August, 2016 when we visited the Eastern Band of Cherokee Indians (EBCI) in Cherokee, NC. 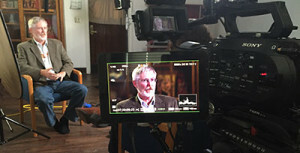 We also filmed interviews and b-roll for the work in progress sample video (trailer). Interviews were conducted by Joshua B. Nelson, our Cherokee historical consultant and on camera guide and narrator. 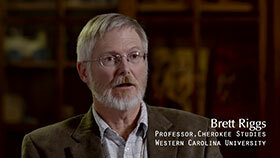 Joshua interviewed Brett Riggs, Ph.D., Sequoyah Distinguished Professor, Cherokee Studies – Western Carolina University. Riggs specializes in Cherokee studies and has worked in Western North Carolina for more than 20 years studying the lives of Cherokee families during the removal era of the 1830s. In his position with the Research Laboratories of Archaeology at UNC-CH, he is helping to establish the National Historic Trail of Tears Long-Distance Trail in the southwestern corner of WNC. A research archaeologist at UNC-CH since 2001, he worked previously as deputy tribal historical preservation officer for the Eastern Band. Riggs earned his doctorate and master’s degree in anthropology from the University of Tennessee and his bachelor’s degree in anthropology from Wake Forest University. 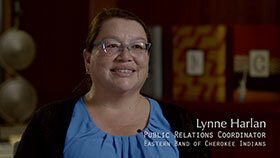 Joshua also interviewed Lynne Harlan, Public Relations Coordinator for the Eastern Band of Cherokee Indians. Lynne spoke at length about the historical importance of Sequoyah in the EBCI community as well as the integration of the Cherokee Syllabary into the EBCI’s new eighty million dollar Cherokee Indian Hospital. Lynne also told us a story of a Kickapoo man from the Mexican Kickapoo Tribe she once met who said his mother would send him letters written in the Cherokee Syllabary. This raised an interesting question, how did a Mexican Kickapoo learn to write in the Cherokee Syllabary? Could this be another piece of the Sequoyah-Mexican Cherokee puzzle? or just another false trail? 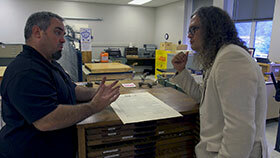 Joshua visited the Nantahala Arts Academy near the EBCI Reservation where he talked with Jeff Markley about the Cherokee Syllabary, printing presses, art and Cherokee culture. Jeff’s class at the Academy explores the use of the Cherokee Syllabary in the print beginning with a brief history of the printing process and the Cherokee Syllabary Font for typesetting as well as the integration of the Syllabary in printed artwork. The visit included a demonstration of the printing process as well as a look at some of the artwork and printing done by current and former students. Finally we capped our trip with a visit to the Sequoyah Birthplace Museum in Vonore, TN about a two hour drive from Cherokee, NC over the Smokey Mountains. The mission of the Sequoyah Birthplace Museum is to promote the understanding and appreciation of the history and culture of the Cherokee Indians in Eastern Tennessee, particularly the life and contributions of Sequoyah. 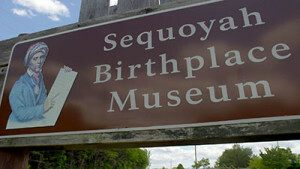 The museum opened in 1986 as a tribute to Sequoyah and the Native Americans who lived in the Little Tennessee River Valley. The museum is located in a 47.5 acre tract on the shores of Tellico Lake nestled at the foot of the Great Smoky Mountains. Owned by the Eastern Band of the Cherokee Indians, the museum is Tennessee’s only tribally-owned enterprise. 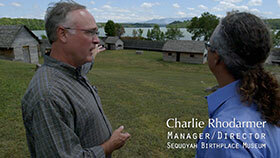 The museum’s Manager/Director Charlie Rhodarmer spoke with Joshua at length about the known facts of Sequoyah’s life, as well as the many mysteries that remain unsolved. After their discussion Charlie led us a short drive to the Fort Loudoun Historic Area which figures prominently in the history of the Cherokees in the southeast corner of Tennessee. It is from the restored original fort’s location where we were able to look out over the Tellico Reservoir, created by the Tennessee Valley Authority in the 1970s, which flooded the old Cherokee Overhill Towns where Sequoyah was born.